I’ve been tracking the UK prison population since the beginning of the year to get a sense of some of the underlying trends. My interest here is the UK prison population, not just the prison population of England and Wales, a figure more commonly the focus of London-based policy elites. I’m also interested in the total population under a prison sentence. This includes those serving a Home Detention Curfew: the latter stages of a prison sentence served under a form of house arrest. So what’s the current picture? In the four months from the start of January to the beginning of May, the total UK prison population went from 99,516 to 100,540. That’s 1,024 more prisoners now than at the beginning of 2012. Put another way, the UK prison population is currently growing at the rate of nine prisoners per day. 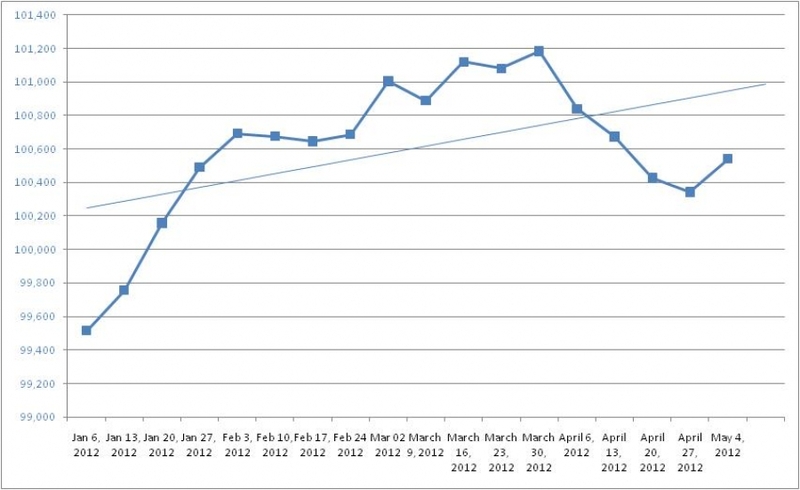 If this trend continues the UK is on course for a prison population of around 102,500 by the close of 2012. The good news is that there is no inevitability here. As the graph above shows, the growth in the UK prison population has been a lumpy affair. It grew by 39 prisoners a day during January, slowing to 10 prisoners a day during February. During March it fell by 5 prisoners a day and by 10 prisoners a day during April. The riots probably had something to do with the rise and subsequent fall in the prison population. Those sentenced to custody late last year will have started coming up for release over recent weeks. Against this, news that there remain hundreds of outstanding cases to prosecute suggests that we may not have seen the end of riot sentencing-induced prison growth. That said, the underlying drivers of the prison population in the UK, as in other countries, are political and economic factors external to the criminal justice process. Tinkering with sentences in themselves will not solve the problem. The bad news is that there is little sign that policy makers have grasped this basic fact, never mind turned it into anything approaching a coherent plan of action. Indeed the latest government consultation continues to push community sentences as central to addressing prison growth, and this despite the clear evidence that this is unlikely to work. So what might a coherent plan of action to control, and then reduce, the prison population look like? How can we downsize prison? Here are my suggestions, in the form of five propositions. Proposition one: a clear, unambiguous and unqualified assertion that high rates of imprisonment are undesirable and a commitment to doing something about it. As one of my colleagues at the Centre for Crime and Justice Studies said the other day, we must be clear that societies with high prison populations are unhealthy. For those taught to believe that prison is a natural answer to the problem of crime, that imprisoning people keeps the rest of us safe, this is perhaps the hardest step to make. In truth, there is no relationship between imprisonment and crime rates. If there was, the United States, with the highest imprisonment rate in the world would be the safest country in the world. Yet its homicide rate is much higher than the UK’s. Proposition two: address the structural causes of high imprisonment in poverty and patriarchy. Societies marked by high levels of poverty and inequality tend to have high prison populations. Prisons predominantly hold poor young men who have engaged in characteristically male forms of violence and disorder. A coherent plan to tackle high prison populations must take both these facts much more seriously than is generally the case. Proposition three: a sustained investment in institutional alternatives to prison and criminal justice. Far too many people with drug, alcohol and mental health problems, for instance, end up in prison because of the dearth of good quality drug, alcohol and mental health services in the community. What is needed is sustained investment in a range of high quality social services and a move away from a reliance on the criminal justice process to somehow pick up the pieces. Proposition four: downsize the criminal justice system across the board. This means fewer police, fewer courts, magistrates and judges, fewer prison and probation officers, fewer public servants of various descriptions processing fewer arrestees, suspects and convictees. This isn’t an argument in favour of turning a blind eye to crime and disorder. We will only be able to downsize criminal justice if we get the institutional alternatives to prison and criminal justice right. The two go together. Proposition five: address the problem at the level of the UK, Europe and internationally. All too often discussion of high imprisonment rates replicates the boundaries of our different justice systems. We talk about the prison population of England and Wales, of Scotland, of Northern Ireland. We then assume it is the job of the respective ministers of justice in those jurisdictions to sort out the problem. In truth, high imprisonment and the bloated criminal justice process behind it are symptoms of a wider social and political malaise. This requires a UK, European and, ultimately, international agenda to resolve. Reforms internal to the criminal justice process have surprisingly little impact on the underlying prison population. This is why conventional reformist demands – more community sentences for example, or changes to sentencing practice – are missing from my list. In a short article it’s also only possible to scratch the surface of a much more complex set of challenges. In the coming months I’ll be working with colleagues and partners to develop these ideas and rekindle the vision of a downsized prison system. 1. The purpose of sentencing should be to persuade and enable offenders to accept responsibility for the harm they have caused, and do what they can to put it right. In the case of prison, there should be the additional aim of preparing them to live a good and useful life after release. 2.. Your Proposition Two: I would suggest that poverty alone is not a factor, but the combination of poverty and lack of rewarding occupation. A policy of cutting costs by cutting staff, both in the public and private sectors, is certainly demoralizing and probably criminolgenic..
3. It’s not clear what you mean by ‘patriarchy’; there are indications that one problem is precisely the lack of father-figures in some sections of the community. Inequality certainly seems to be a factor, but would be mitigated by a philosophy of ‘Much is expected of those to whom much is given’ and even enlightened self-interest. It is in my interest that other people’s children should be well-educated, for example. 4. Proposition Three. The funding system should be arranged so that expenditure saved by reducing the numbers in custodial institutions is available for the projects that enable.those reductions to be made. This is the case with the Youth Justice Board, and has contributed to the reduction in custody of young people. It also enabled the closing of juvenile correctional institutions by Jerome Miller in Massachusetts some years ago. The joining of probation and prisons in NOMS should provide an opportunity for this. .
5. Proposition Four. The new ‘Neighbourhood Justice Panels’ are worrying, because they are part of the criminal justice system yet will also deal with non-criminal neighbour disputes. The expectation should be that anti-social behaviour and minor criminality could be dealt with through restorative practices outside the criminal justice system,and preferably in the Third Sector; courts should be the last resort..
A key to this approach is to replace the assumption that punishment, in the sense of inflicting pain for its own sake, is desirable, effective or popular. To speak of abolition of punishment is probably politically unacceptable at present; but policies which quietly omit punishment and replace it with measures based on making amends and reducing re-offending would stand a chance of acceptance. 2. Yes, poverty does not explain everything. But it is a key driver of criminal justice growth and needs to be taken more seriously than it currently is. 3. By ‘patriarchy’ I mean, broadly speaking, the unequal power dynamics in society between male and female, as well as the gendered roles boys and girls, men and women, learn to and are expected to play as a result. Most violence, for instance, is initiated by boys and men, acting out certain roles and behaviours that could be considered ‘masculine’. 4. Yes, I agree there needs to be a transfer of spending from criminal justice to other social institutions over time. 5. Agree on Neighbourhood Justice Panels. And though I have some questions about restorative justice (see http://bit.ly/SvXPhb), your doubty championing of RJ over the years is legendary and much appreciated. I agree restorative solutions should be much more available than they currently are. I agree also on the problems of punishment. I do think we need to be more overt in challenging the punishment agenda, while also agreeing that much good can sometimes be done by stealth. Perhaps see you on September 13. Re transfer of spending: I would argue for more than a general policy: a *mechanism* to ensure that the transfer actually happened. ‘Payment by results’ could be a basis if the ‘result’ was for example a reduction in the number of months of imprisonment imposed by the local court, and the payment was made to the organization that persuaded the court to make the reduction. One point which neither of us has mentioned here is simply the length of prison sentences. If for example there was a maximum of 21 years as in Norway, and everything else scaled down accordingly, they would still meet the criterion of being ‘proportionate’. Or they could be decimalized: every year’s imprisonment converted to ten months. This would only reduce the prison population by a sixth, but it would be a start! I am also a bit ‘doubty’ [!] about restorative justice, in that I don’t think it is the answer to everything! But it would reinforce, or be reinforced by, other methods such as cognitive behavioural therapy; and its procedure, involving dialogue, could help to emphasise the failings in society that need addressing.